William Grimshaw was born in Darwen, Lancashire in 1868. His parents apparently were William Grimshaw and Martha (Hallas) Grimshaw, and his grandparents were Thomas and Martha (Grimes) Grimshaw. William emigrated to New York in 1890, where he and Elizabeth Carroll were married in 1898. The couple had two children, William F (born 1898) and Dorothy Grimshaw (born 1900). William became a naturalized U.S. citizen in New York in 1919. The family lived in New York until at least 1920, but had moved to Denver, Colorado by the 1930 U.S. Census. William completed a passport application in 1922, which includes much important information as well as a picture. He died in 1936, but the date of Elizabeth’s death has not yet been found. Neither have the locations of their gravesites. 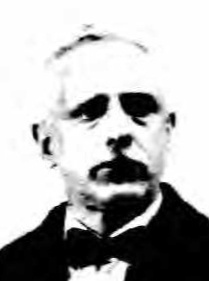 William F Grimshaw, oldest child of William and Elizabeth, was living with his parents in New York in the 1910 and 1920 U.S. Censuses and in Denver in the 1930 Census. However, by the time of the 1940 Census, he was living with his wife Pauline (Polly) Grimshaw in Denver. William and Polly were living in El Paso, Texas by 1947, as recorded in the city directory for that year. William was apparently an engineer, and he worked for Ingersoll Rand as indicated in both the 1947 and 1953 directories. William died in 1976, and Polly in 1997. Both are buried in Restlawn Cemetery in El Paso. Two other Grimshaws who were born about the same time as William, Edward and Robert, are also buried in Restlawn Cemetery. Their connection to William Grimshaw, if any, has not yet been determined. Lee Grimshaw and his wife Grace are also buried in El Paso, at the Fort Bliss National Cemetery see companion webpage). They are apparently not related to William Grimshaw. Much of the ancestry and descendant for William Grimshaw is from that tree. In about 1979 Ed Grimshaw of Lake Charles, Louisiana, purchased a book of Grimshaw family information offered by Beatrice Bayley (see companionwebpage). In an effort to trace his family history, Ed sent inquiries to the nearly 600 Grimshaws listed in Bayley’s book. He received 81 responses to his inquiry letter. One of the responses was from William F Grimshaw’s widow. It was number 38 in Edwin’s collection. Her response included detailed information on William’s origins and family. The response is shown below. Mr. Grimshaws father, William F. Grimshaw (Sr) was born in Darwen, Lans, England March 18, 1868, and died in Nov. 1936. He had a brother Robert Grimshaw, but I do not know his age or anything else about him except that he was native of England. Mr. William Grimshaw Sr. came to the United States when he was around twenty-six years old and remained here the rest of his life. There was also a daughter Dorothy born July 17, 1900, died May 31, 1972. My husband, William F. Grimshaw Jr. was born in New York City Aug 1, 1898 and died in El Paso, Texas Jan. 24, 1976. The information on William and Elizabeth Grimshaw’s marriage is shown below. Ancestry.com. New York, New York, Marriage Indexes 1866-1937 [database on-line]. Provo, UT, USA: Ancestry.com Operations, Inc., 2014. Additional information, identifying William’s mother as Martha Hallas, is on FamilySearch.org. “New York, Marriages, 1686-1980,” index, FamilySearch (https://familysearch.org/pal:/MM9.1.1/F6W9-KJK : accessed 18 Jul 2014), William Grimshaw and Lizzie M. Carroll, 20 Mar 1898; citing reference ; FHL microfilm 1504029. Thomas and Martha were married in Blackburn, Lancashire as shown in the record below. The were in nearby Darwen by the time of William’s birth in 1838. “England Marriages, 15381973 ,” index, FamilySearch (https://familysearch.org/pal:/MM9.1.1/N6TJ-P45 : accessed 18 Jul 2014), Thomas Grimshaw and Martha Grime, 1835; citing Saint Mary, Blackburn, Lancashire, England, reference 2:25Z9PKR; FHL microfilm 1278808. Another record shows the date as June 8, 1835. Shown below is 1871 England Census information on William and Martha Grimshaw, apparently the parents of William Grimshaw. William and Elizabeth were recorded living in Huntington and Mattanhattan in the 1910 and 1920 U.S. Census. They were also recorded in New York City in the 1915 New York State Census. Elizabeth’s mother, Margaret Hayden, was living with the family in all three censuses. Source Citation: Year: 1910; Census Place: Huntington, Suffolk, New York; Roll: T624_1083; Page: 1A; Enumeration District: 1368; FHL microfilm: 1375096. Source Citation: Year: 1920; Census Place: Manhattan Assembly District 19, New York, New York; Roll: T625_1220; Page: 7B; Enumeration District: 1314; Image: 881. Source Citation: New York State Archives; Albany, New York; State Population Census Schedules, 1915; Election District: 32; Assembly District: 31; City: New York; County: New York; Page: 14. Ancestry.com. New York, State Census, 1915 [database on-line]. Provo, UT, USA: Ancestry.com Operations, Inc., 2012. Original data: State population census schedules, 1915. Albany, New York: New York State Archives. The information and images of the 1922 application are shown below. This information and the photo proved to be one of the most significant sources for William Grimshaw. 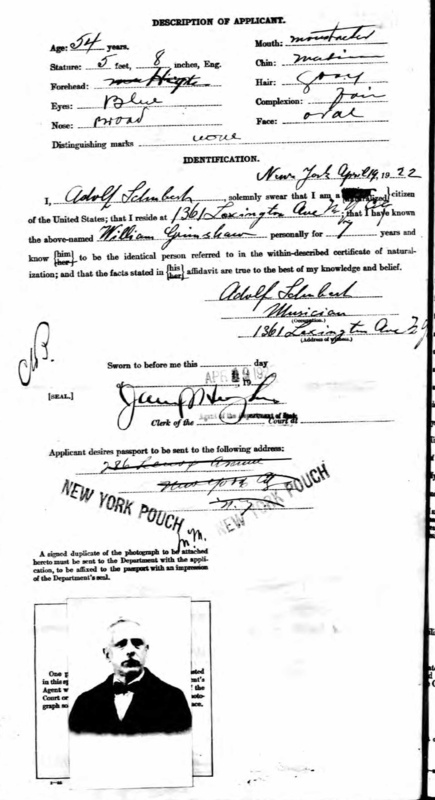 Source Citation: National Archives and Records Administration (NARA); Washington D.C.; Passport Applications, January 2, 1906 – March 31, 1925; Collection Number: ARC Identifier 583830 / MLR Number A1 534; NARA Series: M1490; Roll #: 1919. Ancestry.com. U.S. Passport Applications, 1795-1925 [database on-line]. Provo, UT, USA: Ancestry.com Operations, Inc., 2007. Passport Applications, 17951905. NARA Microfilm Publication M1372, 694 rolls. General Records Department of State, Record Group 59. 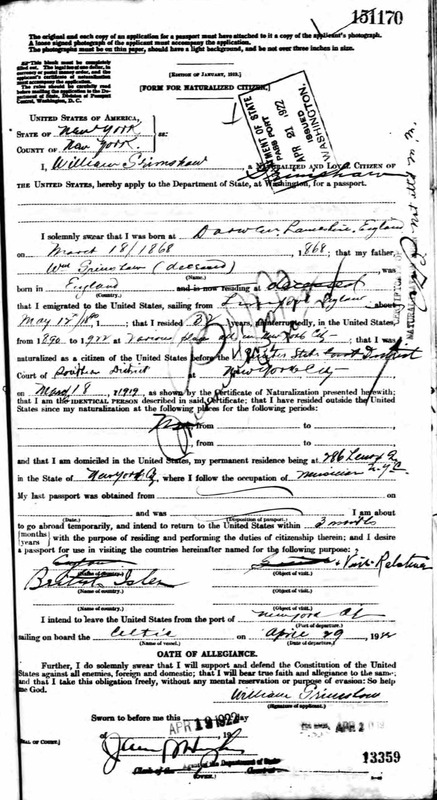 National Archives, Washington, D.C.
Passport Applications, January 2, 1906March 31, 1925. NARA Microfilm Publication M1490, 2740 rolls. General Records of the Department of State, Record Group 59. National Archives, Washington, D.C. Registers and Indexes for Passport Applications, 18101906. NARA Microfilm Publication M1371, rolls 12. General Records of the Department of State, Record Group 59. National Archives, Washington, D.C. Intend to leave the U.S. from Newport, RI? This census record shows that William was born in Englgand and immigrated to the U.S. in 1890. Source Citation: Year: 1930; Census Place: Denver, Denver, Colorado; Roll: 237; Page: 20A; Enumeration District: 0116; Image: 797.0; FHL microfilm: 2339972. William F Grimshaw had apparently moved away from his parents and married Pauline Balfour by the time of the 1940 Census. Source Citation: Year: 1940; Census Place: Denver, Denver, Colorado; Roll: T627_489; Page: 9A; Enumeration District: 16-204. The social security record is shown below. Source Citation: Number: 522-01-3439; Issue State: Colorado; Issue Date: Before 1951. Ancestry.com. U.S., Social Security Death Index, 1935-2014 [database on-line]. Provo, UT, USA: Ancestry.com Operations Inc, 2011. William was first an engineer and then an office supervisor for Ingersoll Rand. Also shown are Lee and Grace Grimshaw, who are described on a companion webpage. The information above permits construction of a preliminary ancestor and descendant chart for William. His position is shown in bold font. Thomas Grimshaw (abt 1813, Over Darwen, Lancashire – June 1881, Lancashire) & Martha Grime (abt 1814, Over Darwen, Lancashire – 1876, Lancashire). Married 8 Jun 1835, Blackburn, Lancashire. |–|–William Grimshaw (18 Mar 1868, Darwen, Lancashire – Nov 1936) & Elizabeth M Carroll (ca 1873, USA – ?). Married 29 Mar 1898, Manhattan, NY. |–|–|–William F Grimshaw (1 or 21 Aug 1898, New York, NY – 24 Jan 1976, El Paso, TX ) & Pauline Balfour (1904 – 9 Oct 1997, El Paso, TX). Polly’s maiden name Balfour was found on an online directory, PeopleFinders. As are two other Grimshaws, Edward and Robert, both born in same timeframe as William. Edward died on the same day in 1976 as William. Directions: From Interstate 10, take the Alamogordo exit to Patriot Freeway. Freda Grimshaw died in Kingsville, Texas. She was about the same age as William F Grimshaw, but it is not known if there is a family relationship. The record of her burial is shown below.